Rice is a commonly consumed grain eaten by about more than half of world’s population. There are in excess of thousands of rice varieties, and it is considered to be the second highest-produced crop, just after corn. The origins of rice have caused to a long debate (1). A number of archaeologists demand that rice originated from India, opponents argue that rice evidence-based owes its origin to South-central China, both of theories may be dated back to about 5000 B.C. Nowadays rice has a special dedicated day among the New Year festivals in China. The most widely used types of rice today are brown and white. Brown rice is a whole grain, consists of carb-rich endosperm, nutritious germ and fibrous bran, removed only outer husk, and whereas white rice is refined, polished grain, removed bran and germ, losing by this way most of the vitamins and minerals. It is being adapted by a number of people that brown rice is better with its nutritional germ and bran, but then again, white rice is mainly artificially enriched by vitamins and minerals to make up the lack of them. So which one is better and healthier? In order to find out the answer, let’s have a little comparison to reveal the pros and cons of each one. Before passing to the next question I would like to emphasize that all the comparative information in the charts below is outlined for cooked brown rice and cooked white rice, since we consume both of them in this state. As you can see in the data set out below white rice wins with lower sugars, sodium, saturated fat and price. On the other hand, brown rice is richer in choline and fiber. In terms of vitamins brown rice is the winner with particularly higher Vitamin B3 and Vitamin B2, slightly higher Vitamin E, Vitamin B6 and Vitamin K. By contrast, white rice is higher in Folic acid (Vitamin B9), which is absolutely missing in brown rice. In the matter of minerals brown rice wins hands on again. As you can easily notice from the charts below brown rice is fairly higher in Magnesium and Phosphorus, slightly higher in Potassium, Copper and Zinc. White rice, on the other side, is higher in Iron and Calcium, lower in Sodium. It is deducible that brown rice is medal-holder in nutritional content comparison. So there isn’t any misconception about the nutritional value of brown rice. Brown rice is higher in choline and fiber. Choline is an essential nutrient, which is neither a vitamin nor a mineral. It is important for liver function, lipid transport and metabolism, muscle movement, cell membrane signaling as a part of neurotransmitter acetylcholine. Choline is crucial for brain and memory development in the fetus, it decreases the risk of development of neural tube defects (2). Fiber contributes to a right function of gastrointestinal tract, cardiovascular system, controls blood sugar and cholesterol levels. Brown rice is higher in Vitamins B2, B3, B6, which all together, as a part of “B vitamin complex”, convert carbohydrates into glucose ensuring by this way adequate energy levels, reduces blood cholesterol and triglycerides levels, prevent and treat some types of anemia, protects our eyesight, hair and skin, as an antioxidant prevent neurological diseases and different types of cancer. On the other hand, white rice is rich in Folic acid (Vitamin B9), which is crucial for a right formation of future parents’ germ cells, development of fetus brain, especially during the first trimester of pregnancy. It reduces blood homocystein? levels, preventing in this manner formation of atherosclerotic plaques and damage of blood vessels. According to the study published in January 2011 (3) consumption of brown rice in place of white rice may lower the risk of type 2 diabetes. The authors estimated that replacing 50 grams/day intake of white rice with the same amount of brown rice had been associated with a 16% lower risk of type 2 diabetes. Have you already made your choice? Slow down; be careful about brown rice overeating, because it also contains Antinutrients and Arsenic. The main antinutrient of brown rice is phytic acid or phytate. Phytate binds metal ions, especially Zinc, Calcium and Iron, making insoluble salts, which reduces their absorption from gastrointestinal tract. That is why excessive consumption of brown rice may lead to mineral deficiency. Alternatively, the ability of phytate to bind minerals has some protective effects, such as decreasing iron-mediated colon cancer risk, minimizing calcification and kidney stone formation, lowering blood cholesterol and glucose levels ( 4, 5). According to the study published in February 2008 (6) that utilized synchrotron-based X-ray fluorescence to locate Arsenic in white and brown rice grains, brown rice had a higher proportion of inorganic Arsenic than white rice. High concentrations of Arsenic increase the risks of cancer and heart coronary disease. White rice may have indefinite shelf life due to its specific processing, when it loses bran, containing huge amount of oils. Brown rice, by contrast, has a shorter shelf life. Owing to higher oil content, contained in bran, brown rice easily goes rancid after about 6 months. But don’t be upset, there are some options, which will help you to store brown rice for a longer period. From the very start it is necessary to point out that both brown and white rice should be stored in clean, dry, airtight containers. These points are critical, because rice easily absorbs dirt, humidity and oxygen, which spoil rice. In these containers you can store white rice for up to 30 years in a cool dry place with oxygen absorbers in container. To prolong a shelf life of brown rice you may store it in refrigerator for up to 6-12 months and up to 12-18 months in freezer. Preparation times of white and brown rice are different again. The cooking time of white rice is about 20 minutes, whereas brown rice’s cooking time is about 40 minutes. In this part white rice is obvious winner with longer shelf life and shorter preparation time. 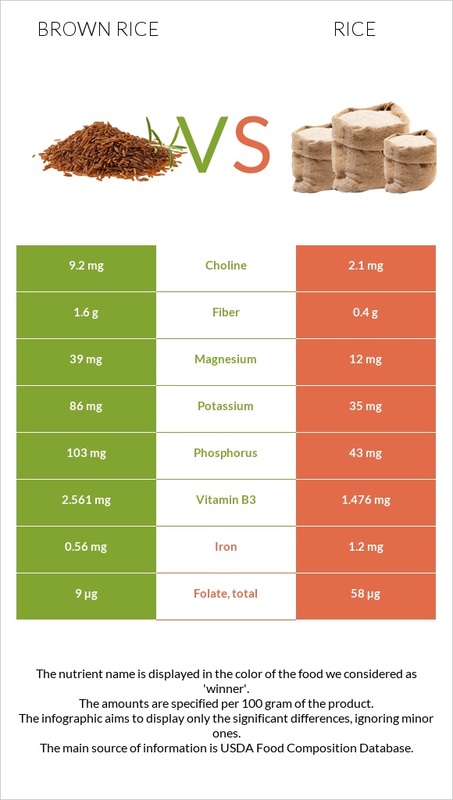 Thus, as shown above, brown rice is richer in fiber and choline in nutritional comparison than white rice. In vitamin content brown rice is title holder again, especially with Vitamin B2 and Vitamin B3, and except for Vitamin B9, that is higher in white rice. In term of minerals brown rice is richer again, particularly in Magnesium, Potassium and Phosphorus. Brown rice is higher in Phytic acid and Arsenic content, than white rice, due to the former’s preserved outer layers. Small amounts of phytate reduce the risk of some diseases associated with hyperabsorption of minerals, whereas significant amount can lead to the mineral deficiency and associated diseases. White rice has a longer shelf life and it takes shorter to cook. So, which one do you prefer?